"Image Courtesy of Euell A. Nielsen"
Hannah Archer Till, a former enslaved African American, served as the personal cook for General George Washington during the American Revolutionary War. Born in Kent County, Delaware, on November 25, 1721, she was originally named Long Point by her father, an Oneida Indian. Her mother was a slave whose name is not recorded. Her owner, John Brinkley, sold her under the name Hannah at the age of fifteen when he brought her to a slave sale in Pennsylvania. She was sold again at the age of twenty-five to Parson Henderson, who then took her to Northumberland, England. It was here that she was treated well and for the first time paid for her services. After returning to British North America, thirty-five-year-old Hannah was sold to Parson Mason of New York. This was her final sale as an enslaved person. During her servitude, Hannah was trained as a cook and was often allowed to sell her homemade products. She saved enough money from those sales to purchase her freedom in 1756 and assume the surname Archer. Soon afterward, she met and married Issac Till, a New York whip maker, and the couple moved to Philadelphia, Pennsylvania, settling in the Seventh Ward. When the American Revolution began, Issac Till enlisted in the Patriot Army. Hannah Till volunteered as well and was hired by the staff of General George Washington’s military service. Noticed for her dignity and grace, Till became the personal cook for the general, serving by his side through all of his campaigns for the next six and a half years. It was important for the general to keep a trusted person as his cook, as poisoning was an often-used assassination technique during that era. During the harsh winter of 1779 in Valley Forge, Till gave birth to son Issac Worley Till Jr. who was one of the few children born in General Washington’s Army during the war. After the surrender of the British forces under General Charles Cornwallis to General Washington at Yorktown in 1781, Till’s services were lent to General Marquis de Lafayette for an additional six months before her term with Washington ended. When she returned to Philadelphia, her family became members of the newly-built First African Presbyterian Church. During Lafayette’s famed trip to Philadelphia in 1824, he visited Hannah Till. The two shared fond memories of the American Revolution and of George Washington, but Lafayette also learned that she was in arrears on her mortgage and in danger of losing her home. He later sent her enough money to pay off her debts. Till was interviewed when she was one hundred and two, and at the time, she was still able to recollect her life and travels. She died three years later on December 13, 1826, at the age of one hundred and five and was buried in Eden Cemetery in Collingdale, Pennsylvania. 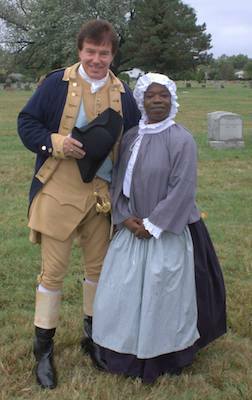 A ceremony was held at Till’s gravesite in Eden Cemetery on October 3, 2015 when the Daughters of the American Revolution (DAR) honored her as a patriot of the American Revolutionary War. John Fanning Watson, Annals of Philadelphia, (Philadelphia, New York, 1830); Marion T. Lane, “Research on Hannah Till uncovers her fortitude at Valley Forge,” Daughters of The American Revolution, January, 2015; Kristin E. Holmes, “Revolutionary slave an afterthought no more,” The Philadelphia Inquirer Online, http://articles.philly.com/2015-10-07/news/67170806_1_american-revolution-marian-anderson-lane.